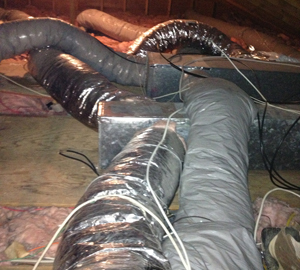 "Thanks for a great job especially air sealing and..."
We had some water damage in basement. Took out ceiling and insulation. Found we had some mice problems as well. Prefer we don't put new ceiling back in. Been reading, not sure if we insulate basement walls and leave basement ceiling without insulation or insulate ceiling and leave walls. If we insulate walls, it appears we have to dry wall the whole thing. That is huge cost for an area that is mostly storage and not conditioned. Just not sure of best approach, cost, etc. Looking for a quote to insult my attic space. Its a full walk up attic 28'x38' with a 12 pitch roof. We live in woodlake condominiums. There are two units to a building of an irregular shape. Our outside walls are very cold resulting in a 400.00 dollar electric bill 12 months a year. I have measured the outside wall temperatures in all rooms while the thermostat was on 70 and tested that on that inside wall. The other walls and windows read from 62 to 65. These are walls that are facing outside not inside walls. How successful have you been with this sort of problem? Converting a seasonal cottage. Concern is the open crawl space so pipes don't freeze. Walls also need to be insulated. Our water heater is not delivering hot water. Your installation crew was polite, considerate and efficient, they left our home neat after each work day. While working in our home to seal and indulate our ducts and air seal our garage, your crew made sure our home was left neat and clean after each work day. We specialize in a variety of services aimed to lessen your home's carbon footprint and save energy and money each month! We offer it all, from air sealing to ductwork to insulation services in Woodbury, CT.
At Dr. Energy Saver Of Connecticut, we offer homeowners of Woodbury reliable window and door replacement options. Did you know that your home's windows and doors play a big part in maintaining the overall comfort of your home? In fact, if doors and windows do not close like they are designed, this can cause air leaks and this will cost you more in energy costs. We offer a variety of windows and doors such as low e glass windows for all areas of your home, and high quality patio and sliding glass doors.Our energy efficient replacement windows and doors have been proven time and time again to improve the energy efficiency and comfort of your home. As the trusted replacement window and door contractor of CT, we provide our customers with nothing but the best! Contact us today for a FREE window and door replacement quote! As a Connecticut homeowner, you know full-well how harsh the winters and summers can be here. One of the best ways to save on your energy bills for years to come, is to update your home's insulation. Dr. Energy Saver Of Connecticut is a professional spray foam and blown insulation contractor, catering to residential homes in Woodbury and nearby. Hop on the path to savings by contacting us today! For a FREE, no-obligation services estimate in Woodbury, CT, you'll also receive a free copy of "Saving Energy and Money at Home," a great book to use as you begin to create a more comfortable, healthy, and energy efficient home! Sirs: This is my granddaughters home and I am interested in replacing 5 windows with single hung vinyl windows in the basement level. 4 windows are approx 36 wide by 43 long. 1 is 25X? I figured you would hsve to do your own measuring anyway. We would like to install a storm door on our entry porch, and replace at least four windows in our home, which are located in 2 adjoining rooms. We bought a house that was built in 1972 and had been neglected for a few years before we bought it. We have noticed that we are lacking insulation in some places and it is difficult to keep the home warm. Quote would be for new construction in Woodbury - probably combo spray and batt. We have a 1758 Cape. I believe there is insulation in the walls in the addition but would like to know for sure, and also would like an estimate on blowing insulation into the walls of the old part of the house. thank you. Renovating an 1800's home for use as the minister's residence for North Congregational Church. Small 2-story 3 BR farmhouse style. Interior has been gutted. Seeking quotes for application of closed-cell insulation. I would like to get a quote for insulating my attic please.